So I've named the chamomile wheat beer Sleepy Wheet; because you get sleepy after having a couple glasses of it. Perhaps I should've used less chamomile (I used a whole package of Celestial Seasonings Chamomile Tea.) The other interesting ingredient in this beer is the yeast. 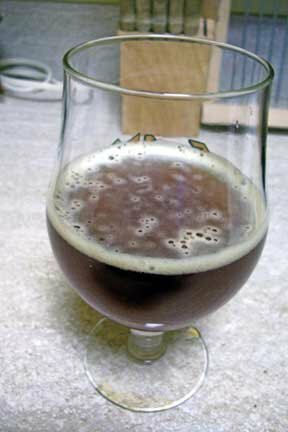 I used Wyeast 3586, the Canada-Belgian strain, and it fermented well. Unfortunately, I think I need to brew a more neutral beer (read: no spices) in order to pick out the esters and flavors of this yeast. Overall, I'm very pleased with the batch (which was all extract), and would like to try it with a different spice instead of Chamomile. Maybe Lemon Verbena? 1.00 oz. of Strisselspalt (leaf) at 2.10 AA for 60 min. 1.00 oz. of Strisselspalt (leaf) at 2.10 AA for 45 min. 5/24/06 - ADF = 71.8 percent, which is a few degrees lower than this yeast is rated. Lots of spices in suspension. Will rack to the secondary for a few days. 5/24/06 - Whew! The chamomile aroma is very evident. Color is hazy gold. Fairly light for an extract brew. A definite juicy fruit flavor is present from the chamomile long with some citrus (lime) detected. Kind of bubblegummy with some light spicy phenols. 5/29/06 - Tasted at bottling. Big time chamomile-bubblegum flavors in this beer. Balance is perfect. Not too sweet, not too bitter. Hops may fade, but beer should get drier, which could keep the balance. 7/2/06 - Already been enjoying this for awhile. The bubblegummy character is not as assertive, but still fairly strong, still a well-balanced and tasty wheat. Added a half ounce mix of dried orange peel and coriander. Added the zest of three small limes and one box of Celestial Seasonings Chamomile Tea for the last five minutes of the boil. I brewed something along the lines of a special bitter today. I used 12 pounds of British Maris Otter malt along with a half pound of Briess Special Roast, an ounce of Willamette "first wort" hops and another ounce of Goldings added for the entire 70 minute boil. I brewed this in typical fashion, collecting about four gallons of wort and diluting with another two gallons or so of spring water for a five-gallon batch, due to the half gallon or more lost to evaporation. Brewing is such way, I ended up with a gravity of 1.040 which was pretty low, even after dilution. I'm planning on splitting the batch between two party pigs because my experience is that lower gravity beers like English bitters taste better on draft. I used a fully inflated Wyeast Activator pack of Northwest Ale yeast and I'm hoping I can package the beer in about a week. Meanwhile, the porter is delicious, and I'm trying not to drink it all up. I'm not sure what the next batch will be, maybe a stronger porter or stout, or even a hoppy brown ale.